I have developed something of a soft spot for The Krotons. The first time I watched it, which was a long time ago in a home county far, far away, I found it rather poor but each time since I've found more to enjoy in it. This time around I thoroughly enjoyed it. Yes, it does have problems. The main one is the appearance of The Krotons. I'll applaud their spinning crystalline heads but their boxy bodies and stubby arms aren't the most impressive. Unfortunately, it is their lower half - often the curse of the Doctor Who monster, that gives away their man in a costume nature. That and the waddle. All these years of watching Doctor Who has led me to identify that waddle. It is the desperate attempt of an actor or stunt person in an unwieldy costume with minimal vision trying to walk without falling over. Alas, The Krotons are cursed with such a walk, which is a shame as it undoes their rather ingenious nature. Then there is the 'intensity' of some of the acting, which is particularly noticeable because there are two brilliant actors doing their thing in this story so the clunkier performances stand out intensely. 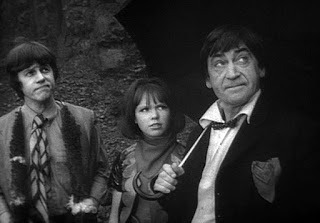 One of them is Troughton - of course - who is at his most mischievous and Pan-ish in this story. He's so good so often that this blog is turning into a series of reviews that might as well just say, 'fine story but made brilliant by Patrick Troughton.' The other is Philip Madoc as Eelek. Eelek is the politician among the Gonds. A man interested in power for himself and prepared for everyone else to pay a price for that power. He first overthrows Selris (James Copeland) and attempts to stir up a full-scale rebellion and then when he thinks he can get rid of the Krotons by selling out the Doctor and Zoe he does that. All with a delightful sneer. Philip Madoc's performance is good. It's mostly underplayed, which makes it so much more effective. Something Troughton himself realized. The Madoc is one of my favorite actors but he's (almost) the best thing in this, apart from Troughton himself. Actually, I'm being a little unfair because I think this is the story where the chemistry* between Troughton, Hines and Padbury finally comes together. It's been hinted at in previous stories but this time it bursts into its full glory. The scenes with Zoe, the Doctor, and Selris in the Teaching Hall after Zoe completes the Gond/Kroton test are delightful. The balance of seriousness and comedy balanced perfectly. This story is notable for being the debut of Robert Holmes, a Doctor Who writer who will go on to be something of a legend. And despite its somewhat lacklustre reputation parts of The Krotons sparkle. It's not all perfect. There's a lot of info dumping in the final episode as The Doctor plays for time with The Krotons. The Krotons slow speech doesn't help here. And is it me or are they speaking with a South African accent? Is this story partly a parable about apartheid? Possibly but I think the moral is more about learning for ourselves and seeking the truth through ourselves rather than relying on others to feed it to us. Whether that be our 'Masters' like The Krotons or even our friends, like the Doctor. It's Thara (Gilbert Wynne) who says after Beta has lamented the Doctor's departure, that the Gonds will have to find their own answers. It's that which is the key to this story. I think that's partly why I enjoyed this story so much. It is underneath all the science-fiction shiny silver stuff trying to actually say something, to present a point of view. And for that it should be applauded. Is it brilliant? No. Is it awful? Definitely not. It's a fair story with a good idea at its centre and a handful of fine performances. Watch it. **And there's isn't enough space here to talk about truth and subjectivity. Just let it be said that I believe that it is possible through discussion and debate to find something that can pass for an objective truth. For a fact. Or at least one that will get us through this life, in this Universe.